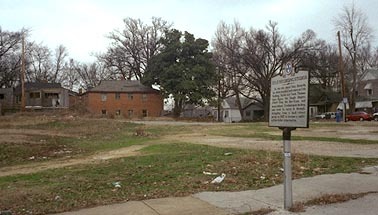 In 1968, when Martin Luther King was shot at the Lorraine and rioting spread everywhere, Memphis police came down here after rumors that white Stax musicians were going to be attacked. We saw the original Stax Records neon signs that used to decorate the front of the place in a blues joint on Beale Street, near our motel. Beale Street, by the way--even though there are no pictures here--has been completely redone over the past several years, and is a great place to visit, with a blues museum and lots of live music. They've managed to keep a lot of the original flavor (Schwab's Drugstore is still in business), though a Hard Rock Cafe has also moved in. Alex is standing on a rock in what must have originally been the foyer of the movie theatre. 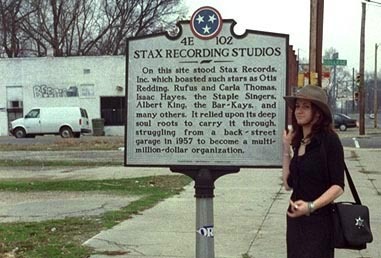 When Stax Records took over the theatre, they converted the old refreshments counter into a record store, Satellite Record Shop (Stax was originally Satellite Records). A few days before we started this trip, Doug saw Booker T. and the MG's play at Tramps in New York City, and heard Steve "the Colonel" Cropper tell the story of how he used to work at the Satellite record store, and there was this kid who would always come in and ask for jazz records, and they'd get into conversations about music. That kid was Booker T. Jones, and he, Steve, and two others eventually became Booker T. and the MG's, who were the house band at Stax for years, appearing on more than 600 Stax albums, including 10 of their own. So this is where all that happened. 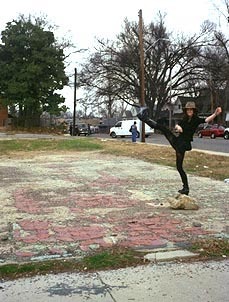 A lot of musical history took place where this vacant lot is today. Otis Redding recorded "Sittin' on the Dock of the Bay" here in December 1967, three days before he died in a plane crash. Isaac Hayes recorded "Shaft" here. Sam and Dave recorded "Soul Man" here, and Wilson Pickett sang "In the Midnight Hour."